Kits may be ordered online by credit card or via PayPal. Click on each Kit photo for more details. Carry your credit cards with style in this striking and practical neck purse. The body of the purse is done in a unique flat zig-zag stitch based on spiral rope. Sculpt this striking three-dimensional pendant with Japanese cylinder beads. A crystal is trapped in the center and raised bands add interest and depth. 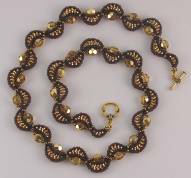 Finish as shown with Peyote beaded beads or design your own cord. Overlapping bugle bead fans are joined with a Peyote stitched edge to create this lacy necklace that follows the curve of the neck. A matching bracelet and pin/pendant complete the set . Use a special tubular herringbone technique to create this supple, sinuous snake for a striking necklace or bracelet.